A simple dip can turn chips, bread or vegetables into something a little more special. Vegetables with a dip makes them appealing as a snack or an appetizer. Bread and butter is great, but an olive oil dip makes it something to linger over. And chips and dip? Well, that's a natural pair. These dips can all be made ahead of time, so you can have them waiting in the refrigerator for company or for snacking. This olive oil dip is perfect for bread sticks or for crusty French bread, or for dinner rolls. Got leftovers? It also makes a great salad dressing. The Garlic Gold Nuggets are dry, crunchy garlic bits that I found in the spice aisle. They can be used as a topping on salads or baked potatoes or vegetables. They added a nice garlic flavor to the dip without making it overly garlicky. A small pinch of garlic powder would be an acceptable substitute. Put the Garlic Gold Nuggets, oregano, rosemary, salt, sugar, and pepper into a small shallow bowl. Add the lemon juice and sherry vinegar. Stir to combine and let sit for 10 minutes for the herbs to hydrate. Top with the olive oil. Taste for seasoning, and add salt, if needed. If it's too tart, you can add a touch more sugar, or add more olive oil, as desired. This dip is great with chips, and it's also perfect with vegetables. If you have leftovers, this makes a great salad dressing - just thin it out a bit with some buttermilk or milk to a pourable consistency. If your horseradish is very fresh and strong, you might want to start with 1/2 teaspoon and and more after you taste it. Horseradish loses its potency over time, so if you've had that jar of prepared horseradish for a while, you'll need more in the dip. Or just buy a fresh jar next time you're at the store. Combine all ingredients in a small bowl. Taste for seasoning, and add more salt, if desired. You can serve this immediately, but I think it's better after an hour or so. If you can't find piquilla peppers, fire roasted red peppers are a good substitution. This isn't a spicy dip, but if you want a little heat, a pinch (or more) of chipotle powder or cayenne would work well in this dip. Combine all ingredients in a blender and blend until smooth. Taste for seasoning and add salt, if needed. Cover and refrigerate until serving time. 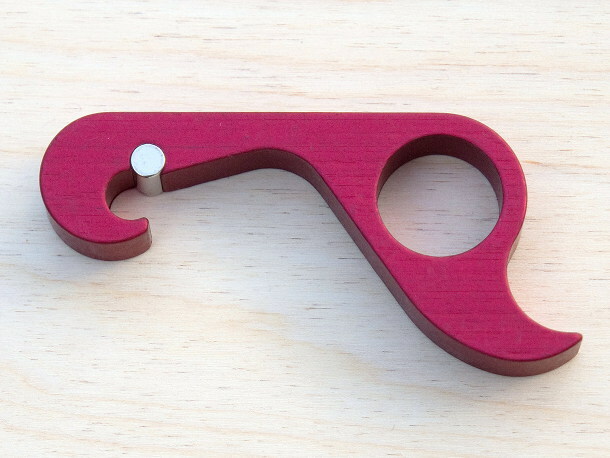 Bottle openers have been around since our cro-magnon ancestors first encountered bottled beer. Okay, maybe not that long, but bottle openers have been around for a long time. You'd think we'd be done updating them by now. Apparently not, because the GrOpener, short for Grab Opener, ($16) has recently hit the market. The unique thing about this opener is that it's designed for one-handed use, so it's ideal for folks who don't have full use of both hands, either because of physical limitations or because they're showing off by opening another bottle at the same time with the other hand. A magnet on the underside of the opener grabs the cap and hangs onto it after the bottle is opened. It also lets you hang the opener on the refrigerator. And the other end of the opener neatly lifts the tab on beverage cans. A handy feature if you've got delicate fingernails. 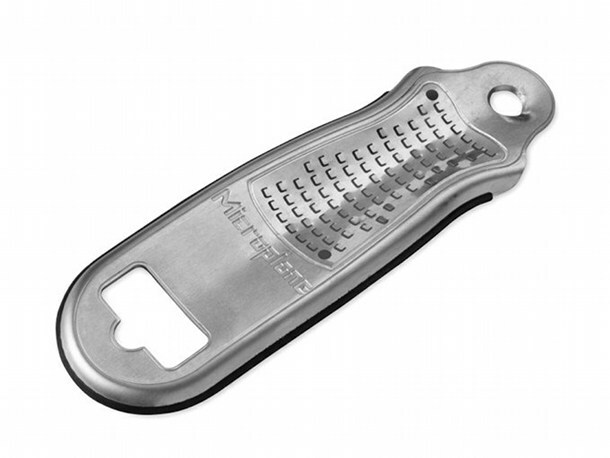 While this opener has some useful features, like one-handed bottle opening - I think the real selling point for this is that it looks way cool. A sample was provided from the manufacturer for a review on Serious Eats. Baby bok choy are so cute, aren't they? I've used them in stir fry dishes, and I've shredded them for salads. I've even put them in soup. But all that slicing and dicing sort of ruins the cute factor. This time, I decided to cut them in half and grill them. Or, actually, I seared them in a cast iron pan. And then, well, you'll see. It's my little "secret" for getting them a little more tender quickly. Remove any damaged or bad leaves/stalks from the outside of the bok choy. Cut them in half horizontally. Drizzle the cut sides of the bok choy with olive oil, then sprinkle with the veggie rub. Or, if you prefer, salt and pepper, or your own favorite spices or spice mix. Heat a cast iron pan on medium high heat. When it's hot, place the bok choy in the pan, cut side down. Leave them in place until they are brown or lightly charred. Turn them over and add 1/2 cup of water to the pan. You don't need to measure exactly - just eyeball the amount. It will boil out quickly and steam the bok choy as is disappears. Remove the bok choy from the pan and serve hot. If you prefer it cooked more, you can cover the pan after you add the water, or continue cooking in the dry pan, turning the bok choy as needed to cook it evenly and keep it from charring. You can also cook your bok choy on the grill - closing the lid with the vegetables away from direct heat (after searing the cut side) will get them cooked through. Not much of a recipe, really, but my absolutely favorite way to cook small potatoes is to scrub them well, then cook them, still in their peels, in boiling salted water. This time I used a mix of red-skinned potatoes, white potatoes (with yellow flesh) and blue potatoes. They look a little more interesting with all the colors in the bowl. After boiling, I serve the potatoes with with just a teeny sprinkle of salt and maybe some butter or a drizzle of olive oil. If you're feeling decadent pass some sour cream or creme fraiche at the table for those who want it. Guild the lily a little with chopped chives, if you like. I know it's ridiculously simple, but sometimes simple is just what you need. I received a box of vegetables from Frieda's Specialty Produce, and the Veggie Rub from Fein Tasting Foods. I was not obligated to write this post. This was just part of dinner. If you're in Colorado, you can find Frieda's products at King Soopers, City Markets, and Sprouts. I liked the previous brown sugar ice cream that I made so much, I decided to make another one. This time, the base has egg yolks and it is cooked. And there's buttermilk. Which, despite the name, is a low-fat option. This isn't a low-fat ice cream, though, since it's got half-and half. And ... instead of maple whisky, I used vanilla for the accent flavor. But the brown sugar and pecans are still there. It's a similar ice cream but not identical. How to decide? Which one should you make? Look in the refrigerator and see what you've got on hand. Heat the half-and-half, brown sugar, and salt in a heavy-bottomed pan, stirring as needed, until the sugar melts and the mixture comes to a simmer. Meanwhile, beat the eggs lightly in a small bowl, just to break up the yolks. Begin adding the hot mixture to the yolks, a little at a time, whisking as you go, until you've added about cup of the mixture to the yolks. Next, add the yolk mixture back to the pot, stirring constantly. Continue cooking until the mixture thickens and if you dip a spoon into the mixture and run your finger across the back of the spoon, the line will stay. Add the buttermilk and vanilla and stir to combine. Pour the mixture through a strainer to remove any curdled bits, into a storage container. Refrigerate until thoroughly chilled - at least 4 hours or overnight. Churn the mixture in your ice cream maker according to the manufacturer's directions. Add the nuts towards the end of the churning time, or stir them in when the churning is done. Transfer the ice cream to a storage container and freeze until firm. A while back, I "met" a guy named Adam Feinberg on Facebook, and he kept posting about his "mighty fein rubs." Fortunately, he was talking about spice rubs. Because otherwise his posts would have made no sense at all. And then I found out that his spice rubs were a local product. Yep, he's from Colorado. Denver, actually. So, not a neighbor, but close enough. Recently, he sent me a lovely collection of rubs. 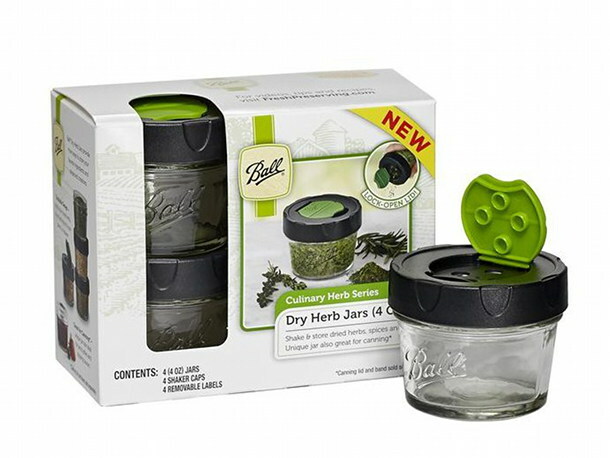 And they fit nicely in the Ball dry herb jars I reviewed a while back. Well, they fit after I used a little bit. And that's kind of the point, right? To use them. First, I tried rubs on two steaks - the Citrus BBQ and the Original BBQ. Then I made a batch of chicken wings on the grill. We like wings, and they're a great thing to have on hand in the freezer for a simple meal. And leftovers are great cold, so I tend to make bigger batches. Another nice thing about wings is that they can be cooked directly from the freezer. Since a rub wouldn't stick to frozen wings, I threw them on the grill, then when they warmed up enough, I sprinkled the rub on. When I flipped them over, I sprinkled rub on the second side. I tried two different rubs on the wings - the Original BBQ and the Everything. As I continued cooking and flipping the wings, I sprinkled on more of the rub to get a nice coating. The wings were cooked through right about the same time the skin had a nice color. But how about the rubs? I used to be a snob about using spice mixes and blends, but I have to say that it's great to have spice mixes on hand that I can just grab and go. The Feiny's spices are all either no-salt or lightly salted, which is great - you can add enough flavor before you add too much salt. And ... they're not just rubs. I used the veggie rub in a vegetable soup I made. And I'm sure I'll find more uses for all of the others. The Original BBQ might be my favorite. I'm planning on using that on some ribs I'll be making a little later in the week. When I get around to making some more creative recipes with the rubs, I'm sure I'll be posting them. Meanwhile, I'm having fun just trying them out. For some reason, I've never thought about using brown sugar in ice cream. But why not, right? This ice cream uses an egg-free and uncooked base, so it's ready for churning right after mixing. When I first started thinking about brown sugar, my next thought was maple. They go so well together. I really loved the maple whisky ice cream I made using Crown Maple, but this time I wanted the maple flavor a little less prominent, so there's just a little fleeting hint of maple in this ice cream. Then, I decided to add some pecans as well. Because, well, why not? Interestingly, this tastes a lot like butter pecan ice cream. It's not just the pecans - the base has a rich, buttery flavor. And, as I planned, the maple flavor is subtle, but it definitely adds its own nuance to the ice cream. Combine the cream, milk, brown sugar, salt, and Crown Maple in a bowl (if you have a batter bowl or any sort of bowl with a spout, that makes pouring easier) or in a large measuring cup. Stir until the sugar is dissolved. Churn in your ice cream maker according to manufacturer's directions. Add the pecans at the end of the churning time, or stir them in when the ice cream is finished. Transfer to a storage container and freeze until firm. Here's a quick smoothie for you - taking advantage of some strawberry yogurt. I love bananas, and they're a perfect smoothie ingredient since they thicken the smoothie so well. And, if you've got a banana that's a little beyond perfectly ripe, it's perfect for smoothies. Add al the ingredients to your blender and blend until smooth. I love ice creams that have a custard base - the egg yolks make the ice cream so rich. But then you don't taste the dairy flavor as much. And sometimes that creamy flavor is exactly what you want. So I decided to make an ice cream that's all about the cream. This is like a frozen, sort-of dense whipped cream. It pairs well really with fruit. Try a scoop with a sweet biscuit or pound cake along with fresh berries. Or on top of baked or sauteed apples. Or on some grilled pineapple. Since this ice cream base doesn't require any cooking - like a custard base does - you can mix it and churn it right away. This is great as a soft-serve ice cream, or let it harden before serving for scooping. This is also a great ice cream for add-ins. One of my favorites is crushed chocolate wafer cookies. Caramel sauce swirled into the ice cream after it's churned is also fantastic. Combine all ingredients in a medium bowl or large (4-cup) measuring cup. Stir until all the sugar is dissolved. Churn in your ice cream maker according to manufacturer's direction. If you're not using it as a soft-serve ice cream, transfer it to a storage container and freeze until firm. This sauce is great on ice cream, either on its own, or along with some fresh strawberries. This is a great use for berries that aren't as pretty as the rest, or the ones that aren't quite the right size. I used Irish whiskey, but this would work with bourbon, rum, American whisky, brandy ... whatever flavor you like. Or, if you prefer, leave it out. Clean and core the strawberries. Quarter them and add them to a heavy-bottomed skillet. Add the sugar and whiskey and cook, stirring as needed, until be berries begin to soften and break down - you want the berries soft, but not completely but not completely obliterated - you want some chunky bits. Turn the heat off and add the lemon juice. Stir. Transfer to a storage container and refrigerate until needed. Serve chilled. Sponsored by Whole Foods. For info, see the tab at the top. Do you make a lot of fancy drinks with fresh citrus? Do you have a bar that's more than just a shelf in your kitchen? Do you like gadgets that preform multiple functions? Are you short on storage space? Then maybe the Microplane 3-in-1 Bar Zester Citrus Bar Tool ($19.95) is for you. It's got a grating surface for zesting citrus, a cutting blade for making citrus curls, and a bottle opener, all in one compact tool. Like every other Microplane zester I've used, it does a great job grating citrus zest. It's not as efficient as a larger zester if you need to zest dozens of lemons, but it's fine for the little bit of zest you might need for a drink at a time. The citrus curler makes nice curls from the peel. That's not something I need often enough to warrant a separate tool, but as an add-on to the zester, it makes sense. And the bottle opener is, well, a bottle opener. If you already have a zester and you don't have a separate bar area, you probably don't need a tool like this. But if you've got a bar and you want to outfit it with the tools you need rather than moving things back and forth from the kitchen, this would be handy. Or, if you've got a small kitchen and not much storage space, this won't take up as much room as a full-size zester. The manufacturer provided this product for the purpose of a review on Serious Eats. Around here, we love liver and onions. Love. We also like leftovers a lot. Obviously, leftovers are good for me because I can make a really quick meal. But they're also a great way to make a completely different meal with less fuss than starting completely from scratch. A roast might come back as a cold sandwich. Or even a stew. Or fajitas. Or a soup. Sometimes a main dish is re-worked to become an appetizer or a side dish. And sometimes the second-day meal is something we look forward to the most. Unfortunately, leftover liver and onions aren't the easiest things do deal with. Overcooked liver isn't a good thing - it gets tough - and if you've cooked the liver once, reheating can be risky. I've made liver pate with cooked liver, and that's fine. But there's only so much pate I want to eat. So, what can be made from a slightly larger amount of liver and onions? When it's not enough for a full meal, but too much for a nibble? A little brainstorming led me to pasta. Some time ago, I made a pasta dish that included chicken livers and onions, so I figured I could make my liver and onions work in a similar recipe. I lobbed a lump of butter into a skillet and cooked it until it started to brown. I added the cooked pasta along with some of the cooking water, which made sort of a sauce. I added salt, pepper, and some ground sage. I added a splash or two of white wine. I tossed that around to coat the pasta, and then added the liver and onions and gave it one more stir and toss before I served it. The point was to get the liver warmed up without letting it cook any further. If I was going to do this again, I'd start with some fresh mushrooms and saute those in the butter to add an extra flavor and texture to the dish. A bit of sour cream or creme fraiche to make a creamy sauce would be interesting, too. Obviously, if you don't like liver to begin with, this won't be your thing. But then again, if you don't like liver, you're never going to have any leftover liver and onions, are you? I've made similar dishes using leftover steak or roast beef, letting it cook just long enough to take the chill off, without cooking any further. So tell me, what's YOUR most creative use for leftovers? I saw an ad for a new bread mix from Fleischmann's and I was compelled to give it a try. I really don't know why. I mean, I make bread all the time. I don't need a mix. But something about the ad I saw made me want to check this one out. So I picked up a box for $2.99. The total weight was 14 ounces, and there were three packages - one with the flour mix, a standard packet of rapid rise yeast, and 1-teaspoon-packet of sugar. I didn't measure or weigh the flour, but based on the total weight of all the contents it would have been about 3 cups. I followed the instructions as though I didn't know how to make bread. Directions were pretty simple - mix the yeast with very warm water, let it sit for a few minutes, then add the flour and mix it in. That's where I ran into a little trouble. The instructions said to stir until the dough came together in a ball. Well, actually, the instruction about "very warm" water was also problematic. I know a lot of people who have murdered whole civilizations of yeast by reading "very warm" and then using the hottest water they can get from their tap. Your body temp is about 99 degrees if you're average and healthy. If you stick your finger in 99-degree water, it doesn't really feel hot or cold. At about 110 degrees, it's comfortably warm. You could put your hand in it and leave it there. At 120 degrees it's very warm verging on hot. It's also verging on yeasticide. The hot water from my kitchen faucet goes up to at least 140 degrees, which is hotter than you'd want to put your hand into. The lesson here: shoot for a little less than "very warm" and your yeast will be just fine. If you shoot past that very warm state, you risk killing the yeast. Back to the stirring, though. I have to say that stirring bread dough with a spoon isn't all that easy. It would have been easier to dump the dough onto the counter and knead it. I mean, even if you don't know how to knead, mushing it around a bit would probably have been more effective than trying to stir it. The next step was to put the dough on a greased pan and then form it into a round or oval. Again, it would have been easier to form the dough into a ball and then put it on the pan. But whatever. I followed directions and made sort of a lumpy round loaf. The loaf rose for a short time, as instructed, then went into the oven. Easy enough. The resulting bread wasn't awful, but it wasn't stellar, either. It was a little sweeter than I prefer, no doubt due to the added sugar and malted barley flour in the mix. It was also a little bit dense. That denseness could be fixed by letting the dough rise a little longer and relying on the feel of the dough rather than relying on the clock. The sweetness - well, that's just the type of bread it is. Not really my cup of tea for an everyday bread, but some folks might enjoy the sweetness. My biggest objection, really, is the price. If you're going to bake bread once a year, it's probably fine to buy a mix like this. But if you want to make bread more often, a jar of yeast and a bag of flour doesn't cost all that much. And another slight objection is the instructions. This could have been a better loaf, structurally, with a slight change in the directions. If the whole idea was to make a bread that wasn't kneaded (I'm guessing because that would be hard to describe on the box) the dough could have been folded a few times. And shaping it first, then moving it to the pan, makes more sense to me. But then I had another idea. I decided to make a similar bread without the mix. I used Red Star Platinum yeast. Not because I wanted to use a competing brand, but because it's what I happened to have in a packet. I also changed the "stir with a spoon" instruction to something that is easy to do and easy to explain, and I changed the rising instruction to something that works better. Still the same basic game plan and something that would have worked on the box instructions just as well as what was there. I know one if the objections to making bread (unless you plan on doing it often) is that most recipes call for bread flour. So I made this one with all purpose flour. I also didn't use all the additional ingredients that were listed on the package - no malted barley flour, no gluten, no nothing. Just plain old unbleached white flour. Drizzle the olive oil on a baking sheet and preheat the oven to 400 degrees. Combine the water, sugar and yeast in a medium bowl. Stir and let it sit for a few minutes until the mixture is foaming. Add the flour and salt. stir until you have a dough. There might be dry spots, but that's fine. Dig your hands in, and form the dough into a ball. Now it's time to do what I've dubbed "air kneading." Pick up the dough, hold an edge in each hand, and pull to stretch it. At this point, it's not going to be very stretchy - it will tear more than stretch, but that's okay, just pull it a few inches. Fold the dough in half, turn it 90 degrees, and stretch it again. Keep stretching and folding until the dough begins to get smoother and stretchy. You can keep going as long as you like, to develop the gluten, but for this recipe it's fine once it smooths out. Form the dough into a ball and place it on the baking sheet. Cover the dough with plastic wrap and set aside until the dough rises, feels sort of puffy, and if you gently press a fingertip into the side of the dough, the indent remains or it comes back very slowly. Depending on how warm your kitchen is, this can take anywhere from 30-45 minutes. Remove the plastic wrap. With a sharp knife, slash the dough as desired, and bake at 400 degrees for 20-25 minutes until the dough is nicely browned and it sounds hollow when you thump it. Let the dough cool completely on a rack before slicing. This is a Sponsored post written by me on behalf of Social Power. All opinions are 100% mine. Social networking has great power - but sometimes it has no teeth. There's a new concept that might change that, and it's called Social Power. The idea is that you can post an issue that you're passionate about, and if 1000 people agree that your issue is important, Social Power will work to resolve the issue. I think this is could be a game-changer for bloggers. I see the same issues raised in the blogging community over and over. But since it's one blogger at a time, the issues never get enough traction to get the attention of the entities who could help to solve the problems. Most of these things aren't interesting to our readers. They aren't important to our readers. So we talk amongst ourselves - and maybe there are a lot of us talking - but we don't have the influence or the resources or the knowledge to get our problems solved. And we don't all have the same concerns at the same time. But on Social Power, everyone doesn't need to get onboard at the same time. Those 1000 people agreeing don't have to band together. They don't need to do anything except agree that there is a problem. They don't need to write emails, send letters, or congregate in one place. They can make a difference simply by agreeing that a problem exists. Just to see how this works, I created my own issue on Social Power about copyright violations on Facebook. Recently it's become a big issue in the food blogging community. It's not an unsolveable problem, but individual bloggers don't have a lot of influence when knocking on Facebook's door. Perhaps Social Power is the answer. At least it's worth a try. But it's not all about bloggers and our problems. Not at all. The issues posted so far range from local issues about public transportation, to getting certain fast-food restaurants to deliver, to addressing expired foods at grocery stores. Anyone can post an issue and try to drum up support. Maybe you care about copyright violations on Facebook, or maybe you don't, but if you enjoy the blogs you read and you'd like to see your favorite bloggers spending productive time creating recipes, taking photos, and writing new posts instead of filing DMCA forms on Facebook, then "like" my issue and let's see if we can get this resolved. We don't want to stop people from sharing our recipes on Facebook, we just want people to share in a way that's legal. And polite. And that benefits everyone involved. And while you're over at Social Power, take a look at the other issues. Like the ones you support, or create your own issue. We've all got gripes. Maybe yours will be the first one that gets solved. We all have issues. Some of us have subscriptions. Let's give social networking some teeth, and see what can get done. So what's new on Planet Cookistry? It's been pretty busy around here. I got some freebies, I won some stuff, and I bought some stuff. And I ate and drank and cooked, too. 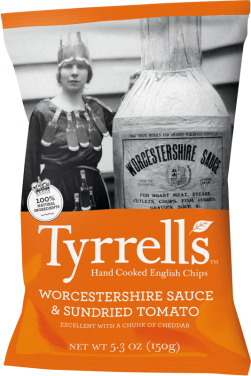 The nice folks at Tyrrell's sent me a big box of potato chips and we've crunched our way through most of them. Interesting flavors and really funny old-time photos on the bags. Speaking of which, they hold a caption contest on their blog where you can win stuff for coming up with good captions. We've been indulging in more snack foods around here lately, and I have to say that it's nice that we can have snacks that aren't full of chemicals, goo, and preservatives, like these potato chips. I haven't opened the bag of veggie chips yet, but that's probably next on the list, but we liked all the potato chip flavors we've tried so far. The one with Worcestershire sauce was one of the more unusual ones, that's for sure. And WHAT is that woman on the bag wearing? I was sent samples of several different types of cocoa from Ingredient Supply company, and I've been trying to figure out a sane way to taste-test compare the three and describe them adequately. I've used the cocoas in hot chocolate, in smoothies, in baking, and in ice cream. And every time I taste them, I notice different things. Sometimes a hint of cinnamon or vanilla in one, or a deeper chocolate in another. But as much fun as I had testing and tasting, I can't say that I have a favorite among the three - they were all really good. The three I received were the Grand Guyacan, Royal Mahogany, and Colonial Rosewood, along with some cocoa nibs and cocoa butter. My suggestion, if you're a chocolate fiend, is to buy two or three (or four!) 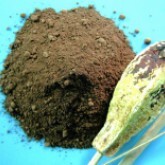 different cocoas and test them yourself. The 4-ounce samples are really affordable, so you can buy a variety and see which ones you like best. And then if you fall in love with one, you can buy a 5-pound bag. If you're really crazy, you can buy a 55.11-pound bag. Meanwhile, you'll be seeing more of these cocoas (and the nibs and cocoa butter) showing up in recipes soon. One that I already posted was a smoothie with banana and chocolate. Highly recommended. I found that one tablespoon of sugar and one tablespoon of cocoa was just about right for a mug of cocoa. If I wasn't doing a taste-test, I might have added a splash of vanilla, a teeny pinch of salt, and maybe a hint of cinnamon or nutmeg. The nice folks at Mission sent me a box of tortillas to encourage me to enter a contest they were having. Well, I never got around to entering the contest, but I did enjoy the new soft tortillas. They're not soft in terms of being squishy or spongy, but they're more pliable than regular tortillas, and less apt to crack or break. I have to say I liked the tortillas, and it's too bad I didn't get around to entering the contest, but my friend Nelly from Cooking with Books took home one of the prizes for her Asian Shrimp Tacos, so that's pretty cool. Now that summer grilling season is here (mostly), I'll probably be making some grilled foods that fit well into tortilla. Too late for the contest (sigh) but that's okay. 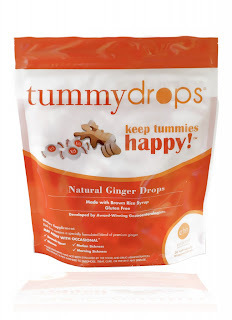 As I was recovering from a migraine (which is always accompanied by tummy trouble) the nice folks at Tummydrops sent me an email and asked if I wanted to try their tummy-soothing drops. Yes, desperately. Since then, I've been lucky enough not to have had any tummy troubles of that sort, so I can't tell you how effective these things are. But they taste pretty good. 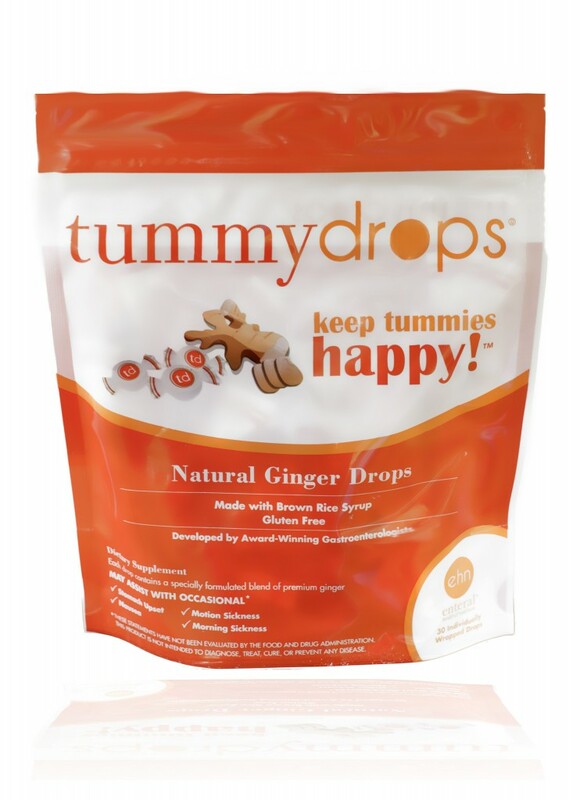 There are two flavors - mint and ginger - both of which are generally known to be tummy-soothing. What I liked about the ginger was that it wasn't too strong. I've tried ginger candies that are way too strong to be pleasant. These were a lot milder. I was going to wait to review these until I had an actual tummy episode, but they've been waiting around long enough. If you've tried them yourself, let me know what you think of them. You might have noticed some posts about the "Year of Purple" and a few references to Frieda's Specialty Produce. We're now BFFs, and I'll be writing about their products now and then. The Year of Purple box I got included purple potatoes, purple sweet potatoes, purple passion fruit, purple artichokes, baby purple artichokes, and some purple juice. I have to say that Frieda's is a perfect fit for my blog, since I'm always looking for interesting fruits and vegetables, and they've got them. I'm really looking forward to working with them on a regular basis. A cocktail recipe with Good Belly. Good Belly is a local company, and I have to say that they're some of the nicest people I know. When my husband got out of the hospital and I mentioned that he was still having digestive issues, they were quick to offer (but not push) some coupons for free Good Belly products. Every morning, Bob had his glass of Good Belly, and when I ran out of coupons, I bought more. And then I tried to foist some regular juice on him, and he said that he likes Good Belly better. Well, okay then. Meanwhile, I made some Good Belly cocktails and smoothies, too. It really is good stuff. Speaking of Bob, he's feeling MUCH better and although he's not quite back to completely normal, he's able to do just about everything he wants to do. Luckily, he doesn't want to wrestle alligators or become an Olympic weight-lifter, because he's pretty far from that. But otherwise, things are pretty close to normal again. Busy Ds is a local company - I found them at the farmer's market and I absolutely had to try their Bread and Butter Jalapenos. I'm familiar with bread and butter pickles, and of course I know pickled jalapenos, and I like both of them. But I've never had jalapenos made like bread and butter pickles. So I picked up a jar, and I've got to say that they're different. The sweet-mustard-tart flavor of the bread and butter pickles is there, but the peppers still have their kick. Totally different and really interesting. 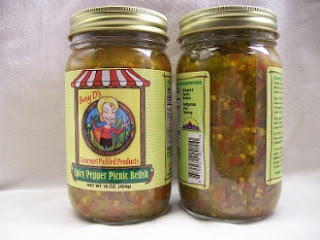 There's also a relish that's basically the bread and butter jalapenos chopped up into a relish. I couldn't find the sliced jalapenos on their website, but they did have the relish. If you really want the sliced ones, they've got a contact form on the site. Or just browse and see what looks good to you. The ghost pepper garlic sounds interesting, too. My previous toaster had just started to misbehave. Here's me, baking my own bread from scratch, then burning it to charcoal in the toaster. Yay, me. Way to go. I knew it was inevitable that I would be buying a new toaster soon, but then fate intervened and I entered a contest on the blog Damned Delicious and I won this very delicious (and expensive) toaster. This may be the toaster of my dreams. I can SEE the toast toasting, so I can stop the process if the toast gets too sunburned. It's big enough to fit the bread I make. And that was a serious gripe about the old toaster. I had to cut bread before toasting, or flip it over halfway through, or live with toast with an untoasted strip. Now, the bread fits and the toast toasts evenly, and I can watch it. Which is actually a little bit silly, but also cool. The toasting elements are above and below the toast, but somehow it works. And the toast seems different than what I was getting from my old toaster. Now, the bread is crisp and toasted on the outside, but still sort of soft and warm on the inside. In the old toaster, the toast emerged mostly dried out. Maybe there's some magic in the way the Magimix toasts. I don't know. But so far I'm really pleased with it. Chuao Chocolatier is holding an "I Spy Chuao" Instagram sweepstakes, with the grand prize of a $250 gift card. Use hashtags for the name of the #retailer, #city and #street. The I Spy Chuao sweepstakes ends on May 24, and with a winner every day of a gourmet Chuao Chocolatier chocolate bar. The grand prize winner will win a $250 gift card to the retailer tagged in their entry. Get the complete details at Chuao’s website. 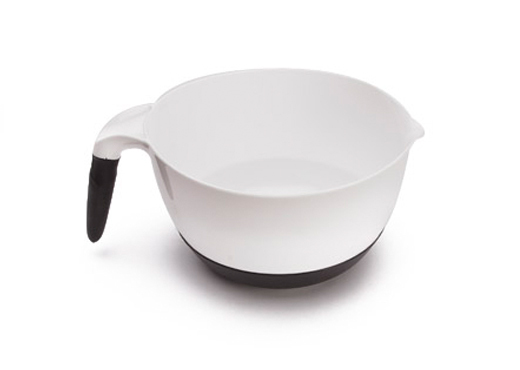 You still have time to enter to win one of the batter bowls I'm giving away (through May 21). AND to hunt for as many codes as you can find in the HUNT sponsored by Good Cook. Special offer for FOOD BLOGGERS! If you are a food blogger, OR you're some other blogger who is running a food-related giveaway, please feel free to post a link to your giveaway over on my Facebook page. They'll usually land in the "posts by others" section and I will share them to my page as I have time. Sometimes they land in my Facebook spam, so if your comment and link vanishes and I don't dig it out in a day or two, just leave a comment for me without a link and I'll go hunt down the link. You don't need to ask first before you post a link, just post. If you want to include a photo, that's cool, too. I've gotten so much support from so many bloggers that the least I can do is promote a few contests on my page. And I like contests (see winning of toaster, above) so I might enter yours! Please, though, food, kitchen and cooking-related only. I do believe in unicorns, I do believe in unicorns. Oh, wait, I mean FAIRIES! This was the most mythical-looking creature I could find. I was recently visited by a critter called the Fairy Hobmother, who apparently flits around to blogs and bestows Amazon gift certificates. Not entirely a magical creature, the Fairy Hobmother finds new blogs in a very human way - by searching through the comments on blogs he/she/it has already visited. Some time ago, I commented on a blog the Hobmother had visited and that's how I was discovered. So, if you've got a blog and you leave a comment here, make sure you leave a link to your blog (it should be automatic in CommentLuv). Maybe the Hobmother will visit you, too. So, I'm fairly certain that some fairies do exist, I'm pretty sure there are no unicorns, and I'm holding out hope for dragons and house-cleaning elves. You? 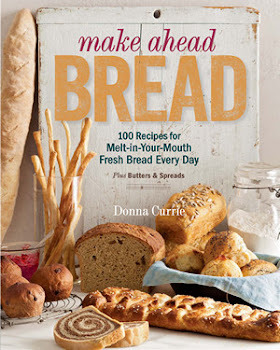 In one of the bread books I have, the author said that there's really no wrong way to knead bread dough. As long was you get the results you want, any technique is fine. I've found that's pretty much true. Some methods give you quicker results. Some are easier on the wrists. Some are better for wet doughs and some are are better for dry doughs. I'd suggest trying different methods until you find one you like. And maybe adjust your method based on the dough. This method, that I call "air kneading." is like the stretch and fold technique that's used for very wet doughs, with some changes. 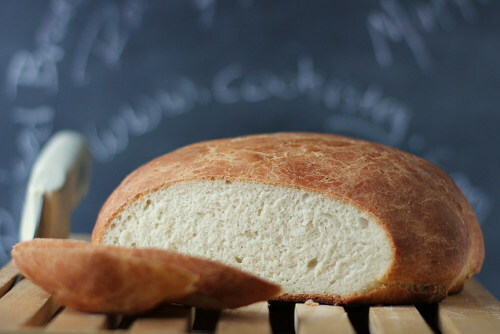 This wouldn't work for a super-wet dough or a really dry dough, but it's fine for average bread doughs. And there's a limit to how large of a batch of dough you would want to knead with this method. Once the dough is mixed and can be formed into a lump, pick up the dough, hold an edge in each hand, and pull to stretch it. At this point, it's not going to be very stretchy - it will tear more than stretch, but that's okay, just pull it a few inches if that's all you can do. When you first start handling the dough, it will stick to your hands, but as you keep working with it, it will unstick. You can put from side to side, or if it's more comfortable, position your hands so you're stretching it vertically. This is sort of like pulling taffy, but it's not hot and it's not nearly as stretchy. Or it's like working with elastic exercise bands. Fold the dough in half, turn it 90 degrees, and stretch it again. You don't need to be precise about the pulling and folding and turning. Just have fun with it. Keep stretching and folding until the dough begins to get smoother and stretchy. It will seem much less lumpy and it will stretch more and tear less. At some point, it will stretch rather than tear, but you'll also feel it getting rubbery, like it wants to bounce back rather than staying stretched. If the dough gets too difficult to pull because it's too bouncy, you can let it rest for five minutes or so, then keep going. Or you can start kneading using this method and finish with a more traditional sort of knead. And, if you need to mix in additional ingredients towards the end of kneading, for sure you'd want to use a traditional on-the-work-surface technique. How much you need to pull and fold to get the the correct consistency depends on the dough formula as well as how well-kneaded the dough has to be. If the dough is going to be resting overnight, a few stretches and folds might be enough. If the dough needs to pass the windowpane test, you'll need to work with it longer. I find that this sort of kneading is easier on my hands and wrists, and its sort of fun to pull and fold. When I was growing up, salad meant greens -usually iceberg lettuce - and salad dressing. Salad was something that was eaten before dinner. It sure wasn't something that was eaten as a meal. Okay, maybe there was the occasional tuna salad. But even though "salad" was in the name, it wasn't something eaten like salad. It was a sandwich filling. Now, salad in my life has broken out of its mold, It can still be a starter, but it's just as likely to be a side dish or a meal. In summer, a nice light chilled salad is particularly welcome for lunch. And a hearty - but chilled - chicken salad makes a great salad nestled in a lettuce cup, or it makes a great sandwich filling. The chicken salad is a great way to make use of leftovers, too. Remove the skin and bones from the chicken, and cut into a medium dice and add it to a medium bowl. Add the celery, radishes, peppers, eggs, capers. salt, pepper, mustard, , yogurt, mayonnaise, paprika, and nutmeg. Stir gently to combine. Taste for seasoning and add more salt as needed. Serve in lettuce cups (garnish with extra paprika, if desired) or use as a sandwich filling. This salad makes a nice appetizer with just a few shrimp, or it can be a full meal with more shrimp - it's your choice. The greens are dressed with a fruity dressing, with an additional avocado sauce for the shrimp. Any extra avocado sauce is a great dip for chips, or you can thin it with milk or buttermilk and use it as a salad dressing. You could use regular bell peppers for this salad, but the mini peppers make nice, small rings that look pretty in the salad. Tear the romaine into bite-sized pieces and add it to a medium bowl. Cut the zucchini in half horizonally, then slice into thin rounds and add them to the bowl. Slice the radishes into thin rounds and add them to the bowl. Core and seed the peppers, slice them into thin rings, and add them to the bowl. Combine the vinegar, olive oil, salt, and sugar in a small jar with a lid. Shake the jar to combine and emulsify the dressing. Pour the dressing over the salad and toss to combine. In a small bowl, combine the avocado, yogurt, lime juice, salt, and chipotle powder. Stir well. Arrange the greens on a plate, dollop the as much of the avocado as you like in the center, then arrange the shrimp on top. Serve chilled. Refrigerate the remaining avocado sauce. Unlike guacamole, this doesn't turn brown quickly, so it will last at least several days in the refrigerator. For information about Whole Foods, see the tab at the top. I always hope to find new, quirky, innovative, unique, interesting, useful, improved, fun products to review. But it's pretty unlikely any product will check all those boxes. I mean, there aren't that many truly new kitchen gadgets being invented. This time, I think I actually found something new: The Spifter ($19.95). After I saw it, my very next thought was, "Why didn't someone think of this before?" It's perfectly logical. The Spifter is a spoon-sized sifter. It would take you forever to sift flour for your cake, but it's ideal for neatly spewing paprika onto deviled eggs or sprinkling colored sugar onto cookies. Since it's small, you get more controlled placement of whatever you're sprinkling. 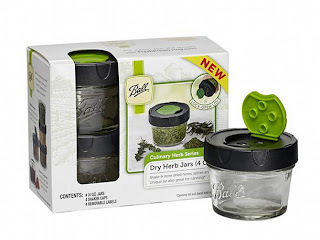 There are three removable mesh sifter bowls that snap in and out of the spoon, with fine, medium and coarse mesh, so you can sift fine powdery stuff or slightly coarser salts or sugars or herbs. Perfectionists and food bloggers looking for pretty presentation are going to love this gadget. Cooks who care less about messy garnishes probably won't be as excited. And I'm sure there are professionals who can manage perfect paprika placement without needing a gadget. On the other hand, I can use all the garnishing help I can get. I almost wish this was a three-spoon set instead of having the removable bowls since I'm terrible at losing small things in my kitchen drawers, but that's my issue and not a flaw in the product. Overall, this is a pretty cool idea.